Many thoughts come to mind when setting the groundwork for successfully participating in a sporting event, race or activity. Whether you are a recreational sports enthusiast or competing at a high level, everyone desires a successful event, and “success” means something different for each participant. When speaking to a recreational sports enthusiast, most will tell you that they are looking to maintain good health, have fun, and complete the event. On the other hand, the competitive athlete will define success only when they outperform others or themselves. Let’s take a look at some considerations for setting the groundwork for competing in a successful event. Planning – Planning your training weeks in advance before an event will pay off on the day of the event. It reduces stress and provides confidence that you prepared physically and mentally to complete the task. In addition to mapping out your training calendar, outline your goals for the event early in your training. Then, trust that the training sessions have prepared you to be successful in meeting your goals. Organization – During the weeks prior to the event, it is important to do your homework. Create a check list with items needed for the event. Purchasing appropriate clothing and equipment early will give you time to test and exchange items if needed. Packing all the necessary items for the event a few days in advance will help eliminate stress on the day of the event. Check the weather – If the event is outdoors, always keep in mind weather conditions for the day of the event. Pack additional clothing in advance or equipment options for unexpected weather changes. Visualize – It is helpful to visualize your plan of action during the event. What strategies are you going to use to meet your goals? When will it be the best time to push harder on the course or ease up? Focus on each aspect of the event. It is better to break it up in small parts as you transition from one mile to the next. 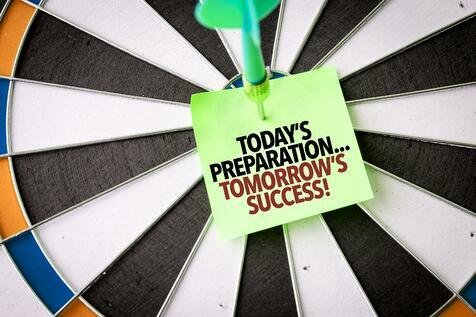 Visualization prepares you mentally providing you with positive thoughts and images for a successful outcome. Do not try anything new – It's not a good idea to try anything new on the day of the event. For example, don’t try new foods/drinks en route and don’t use new gear that hasn’t been road-tested. Stick to your plan. Your training sessions have prepared you for this day. Trying out new strategies does not prepare you for the risk of new unexpected challenges that can occur. Expect the unexpected – It’s common for an event to stray from your plan; be adaptable and expect some variation of what you’ve outlined. A change in the course, unforeseen weather, or equipment breakdowns can occur causing disruptions in mental focus and attitude. Implement your plan B and stay the course! Do not let the unexpected defeat you. Keep a good pace – Have a strategy in place based on your performance skills. Are you starting the event fast or slow? Are you going to remain at a steady pace throughout the course? Consider how weather conditions may affect your speed and performance. How will extreme hot or cold conditions or gusty winds effect your pace? Do you need to adjust your goals midway through the course? Consider all of these questions and more before race day. Nutrition – It is not a good idea to try new foods on the day of the event. Many athletes are nervous on the day of the event and trying new foods can upset the stomach causing discomfort. Timing of nutrition during an event is especially important to consider for longer distances. Plan what types of food or drink you will pack for the event and when would be the best time on the course to ingest them, or will you rely on water or food stations provided on the course? Following through with these considerations will set the groundwork for a successful event. Meeting your goals is satisfying and provides confidence for the next one! MOTIVATION: As a fitness professional, I’ve encountered several clients who admit that motivation is the number one reason why they cannot commit to a regular exercise routine. 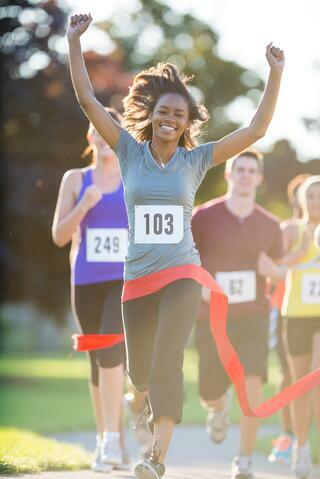 Having a date circled on your calendar marked as “race day” can be one of your biggest motivators. Put some skin in the game by signing up and paying for the race well in advance, and register for a training program to hold you accountable in the weeks leading up to the race. By doing both of these, the likelihood of you sticking with it are much greater. CAMARADERIE: Spending 10-12 weeks with the same training group is bound to lead you to new running or walking buddies. Whether it’s during a training program or at the start or finish line, you’ll be surrounded by like-minded people with at least one common interest. SUPPORT A GOOD CAUSE: Most races donate the registration proceeds to foundations ranging from curing chronic diseases, to disaster relief. You’ll get to conquer your goals with friends while donating to a good cause. FREE RACE SWAG: Races are getting extremely creative these days. Most races will reward you with a free shirt and medal, but other freebies like hats and water bottles are becoming even more common. Who doesn’t like free stuff right? In additional to free swag, there are yummy treats and beverages at the finish line! FEELING OF ACCOMPLISHMENT: Completing a race can be one of the most exhilarating feelings you’ll experience; crossing that finish line for the first time is something you’ll remember for a very long time. Even if it’s your 100th time crossing the finish line, the rush never gets old. I don’t believe that anyone can ever grow inside their comfort zone. If you’ve never completed a race, now’s your time to step outside your bubble and make a change. If you’ve completed several 5K’s but a half marathon seems like a daunting task, commit to proving yourself wrong and take the challenge to go 13.1. If you’ve completed a half-marathon or full marathon, step outside that comfort zone and try your hand at triathlon. There’s a world of creative races out there so find your niche, start your training, and reap the benefits.